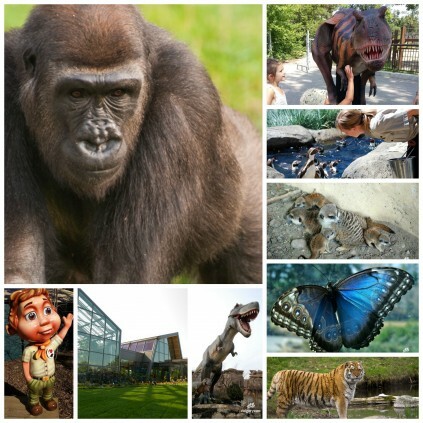 What to do at the zoo…on a long weekend? It’s the August long weekend, and you’re looking for something fun to do with the family. Or maybe you’re looking to have a great day out with friends. Whatever you have in mind, the zoo has something for you to make that summer day extra memorable! Here are some suggestions to help you plan your visit. 1. Travel back in time to Dinosaurs Alive in Prehistoric Park. Stand in the shadows of the mighty Tyrannosaurus Rex, and explore fantastic new additions like photo opportunities, dino dig and slide. Our favourite dino expert Sam will guide you through the park- look out for his tips! It’s a ROARING good time. 2. Snap a #selfie in Canadian Wilds when you find our grizzly bear statue, and stroll up to Cequel Lodge and meet our river otter family. It’s going to be a hot weekend, but they don’t fear the heat- they have the best otter swimming pool around. See if you catch them on the slide! 4. Don’t miss seeing our hippo Lobi perform his backflips in his pool! You’ll need patience, but in the meantime check out the rest of Destination Africa– including our growing slender-tailed meerkat family or our western lowland gorilla troop. 5. Keep an eye out for Rex– he’s our new dino mascot and he likes to take a stroll around the zoo. While you keep an eye out for this active dino, don’t forget to stop by the free prehistoric programming, including Dino Exploration at 4 p.m.
6. Take a break from running around and bask in the tranquility of our indoor gardens in the ENMAX Conservatory. The Garden of Life is home to some fascinating plants, and the Butterfly Gardens are sure to catch the attention of the family, big and little. 7. Check out a free program! A great value add to your visit, you can attend a keeper talk, learn from an interpreter, or meet an animal up close at a Creature Feature! 8. Need to refuel? Have a sunny picnic in the Dorothy Harvie Botanical Gardens on one of our many lawns, or head to Kitamba Café for some hot food and tasty beverage from Java. If you’re looking for a longer sit down, try a great meal at our locally grown restaurant, Grazers. Our freshly baked bread and mediterranean vegetable gnocchi will give you energy to for the rest of your visit. 9. Cool down with our penguins and watch as the birds swim right under your feet. You might even end up in the splash zone if you arrive in time for a feeding. Find them in Penguin Plunge. 10. Burn off some steam at our Kinsmen ZooVenture Playground, or take a spin on the wildlife carousel. You might even ride in style on the zoo train! Options abound for those who like to adventure. Take your pick here. Bonus: Round out your trip with a soft serve ice cream cone- the best in the city! Or be daring and try our famous screamers (that’s a soft serve and slushy combo). Find them at Kitamba Java or the Dairy Bar.